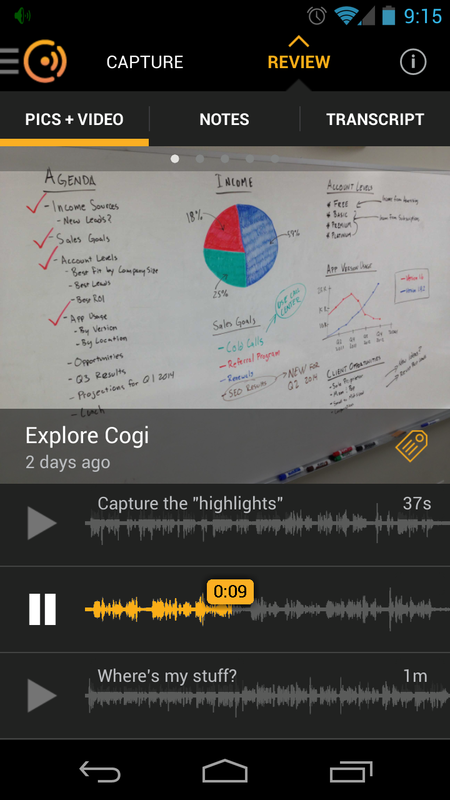 Cogi is a productivity app that lets you easily capture only the 'aha moments' from your conversations that caused you to think, "Gee, I should have written that down." Once captured, you can review the highlights of your conversations all in one place, get transcripts, and share them with others. 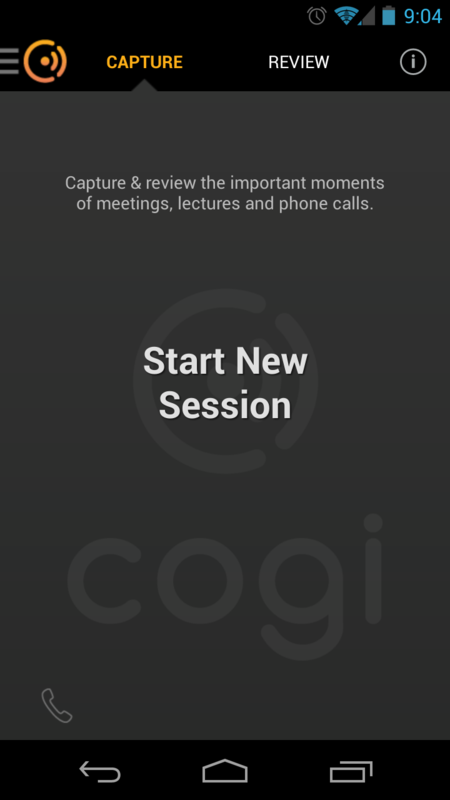 Cogi is perfect for lectures, meetings, phone calls, interviews, and in-person conversations. You can actively listen and stay engaged in the conversation, enjoy superhuman recall, and never miss key ideas and non-verbal cues by stopping to take notes. The Cogi app is unique. 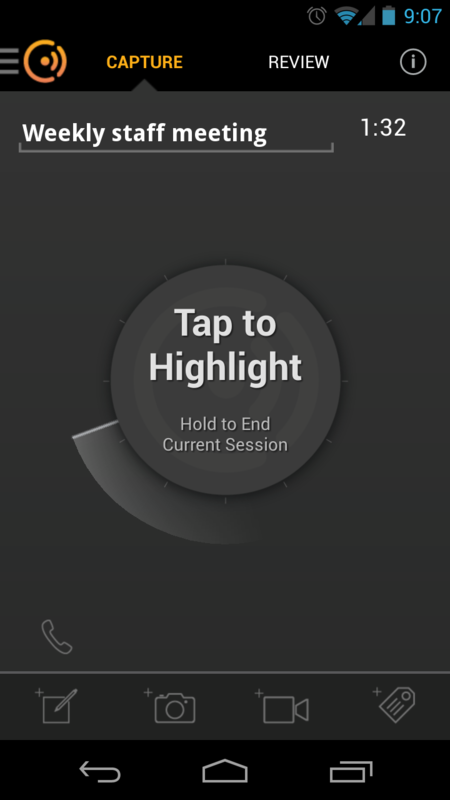 When you start a session, the app listens but doesn't record anything until you tap the highlight button. Then, Cogi “backs up" to capture the important highlight since you don't know what's important until you've already heard it.  This avoids having to record the entire conversation and keeps you focused on the continuing conversation. 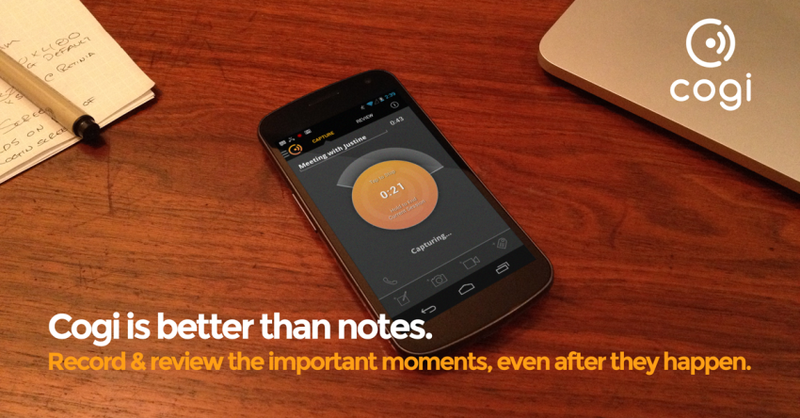 With Cogi, note taking becomes simple. All of your sessions are saved in one place, which makes reviewing your audio highlights and transcripts easy. You can also add photos, additional text, and tags for easy search. Sharing your sessions with team members keeps everyone on the same page. Cogi's core features are completely free and will continue to be free without the annoyance of any advertisements. And Cogi's development team is continuing to enhance our free features. Our advanced features have some costs to the user. • Cogi Cloud. 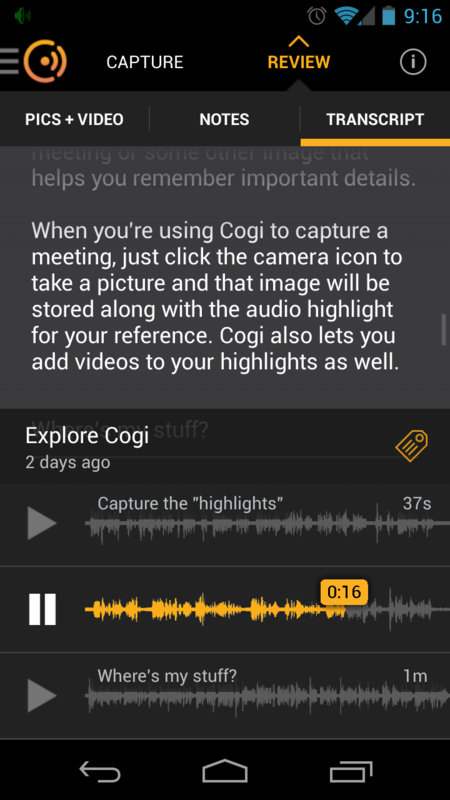 Backup, view and share all your Cogi session content online via any device without filling up your phone's memory. The subscription cost is $5 per month. Cogi Cloud is due for release later in 2015, so stay tuned! • Cogi Phone. 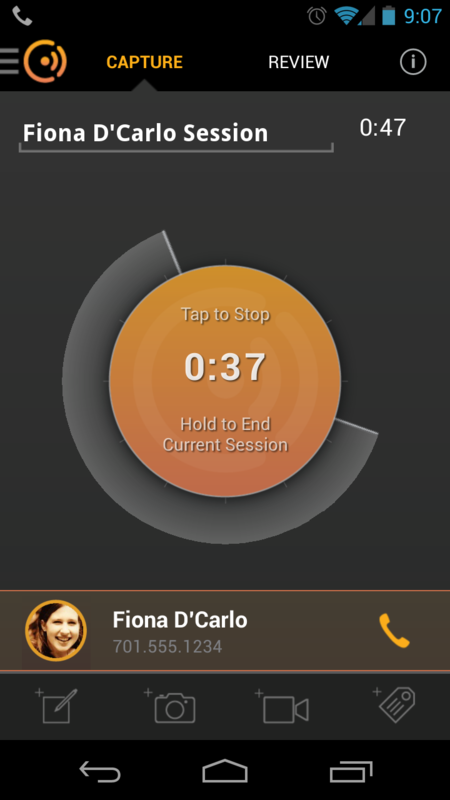 Capture important moments on phone calls as easily as in-person conversations and lectures. Service supports U.S. Domestic numbers currently at a cost of 3¢ per minute of call time. • Cogi Scribe. Generate secure, high-quality and highly accurate transcripts for your recorded content in about a day for only $1.50 per minute. “This is an incredibly useful app. Its simple design is its strength. It's like having your own audio time machine in which you can reach back in time and retrieve a valuable sound bite or idea from a meeting. Look forward to seeing how this app develops going forward." “So far... awesome. Recording every minute of a board meeting was nuts. This is awesome…"
“Play Store is clogged with apps that reinvent the wheel (same or less features then built-in stock app). Recording apps are no exception. The Cogi recording app on the other hand is one of those gems that offers something new to the table. For this I give "Cogi" 5+ well deserved stars."